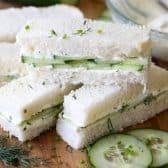 Cucumber Sandwiches are a traditional finger sandwich for luncheons or teas but they’re also a sandwich we love to enjoy at picnics or for lunches! 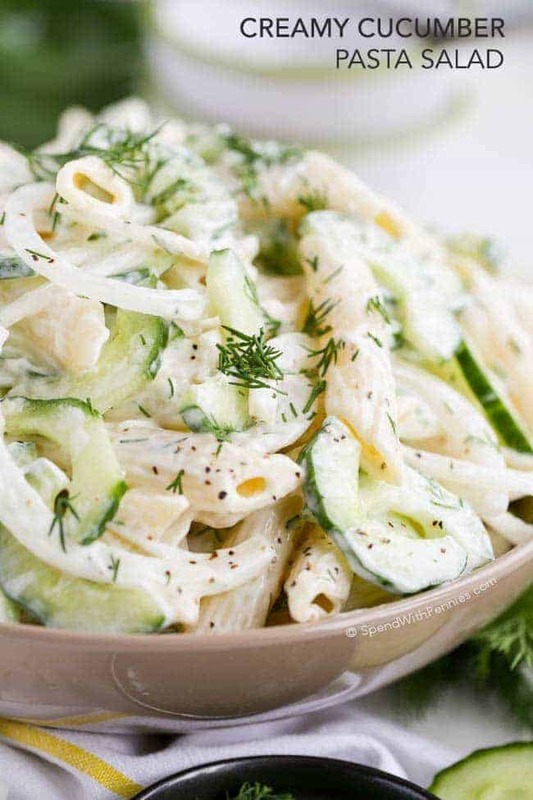 Cream cheese and fresh herbs are combined to make the perfect spread and it’s topped with fresh sliced cucumbers for a refreshing bite. 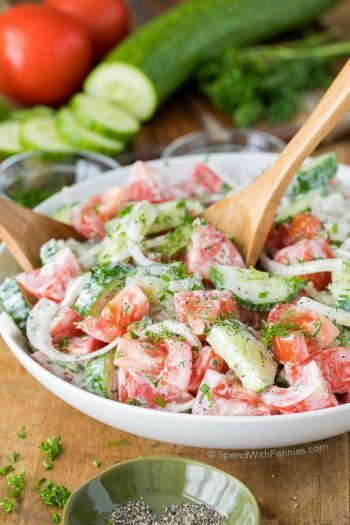 Cucumbers are a summertime staple and perfect for refreshing Creamy Cucumber Salads, creating delicious dips (like Greek Tzatziki) and of course delicious Cucumber Sandwiches! 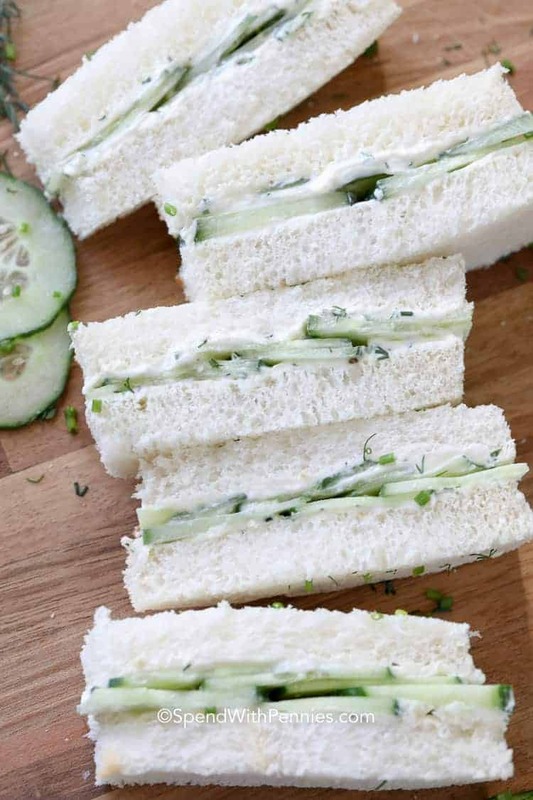 These little sandwiches have been around for as long as I can remember… paper thin cucumbers, dill and chive cream cheese spread sandwiched between crustless bread. 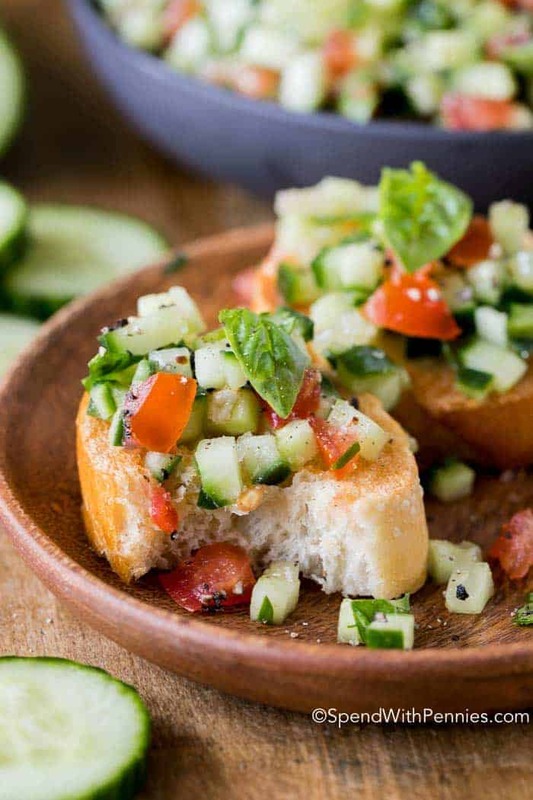 These easy cucumber sandwiches make the perfect appetizer for any occasion. 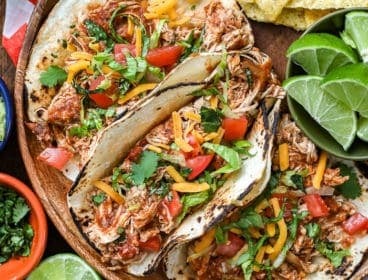 They’re light and refreshing and everyone loves them! 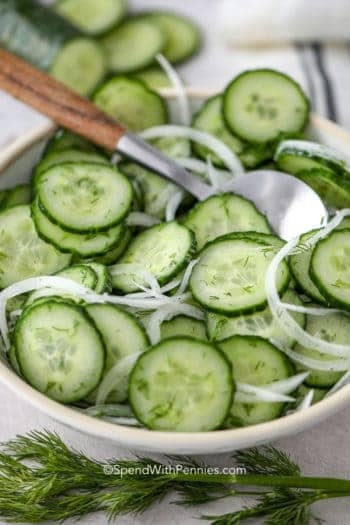 Cucumber Sandwiches are so easy to make. I start with cream cheese, mayonnaise and fresh herbs. 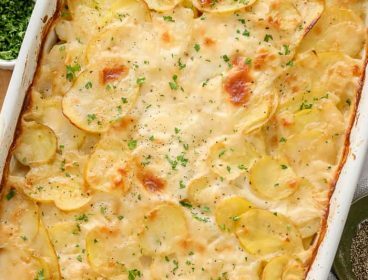 While I use dill and chives, you can use your favorites or whatever you have on hand. 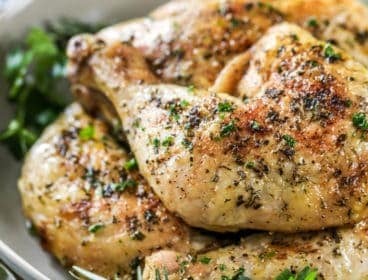 If you don’t have fresh herbs, you can substitute dried or even skip the herbs & mayonnaise and add ranch dressing (or homemade ranch dressing mix) in their place. 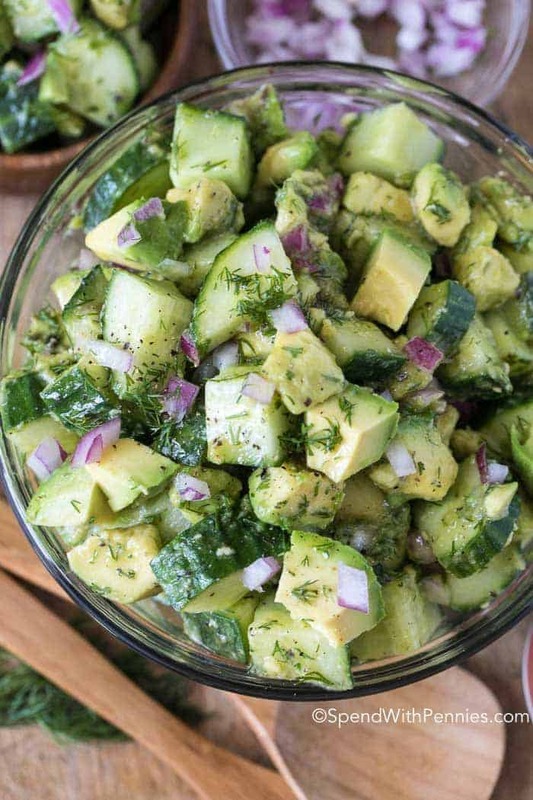 Once the spread is all mixed up, you’ll want to thinly slice your cucumbers. 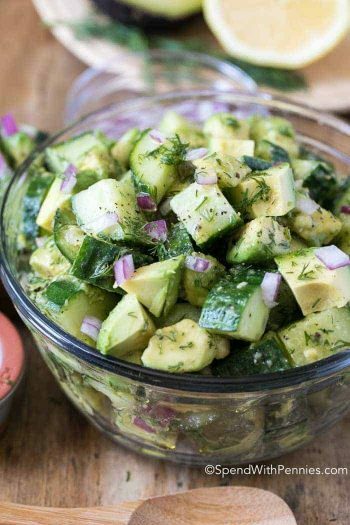 English cucumbers are my favorite for this recipe as the seeds are small and delicate. I personally prefer peel on for color but they also can be peeled. I add a some extra herbs and pepper on top for flavor. 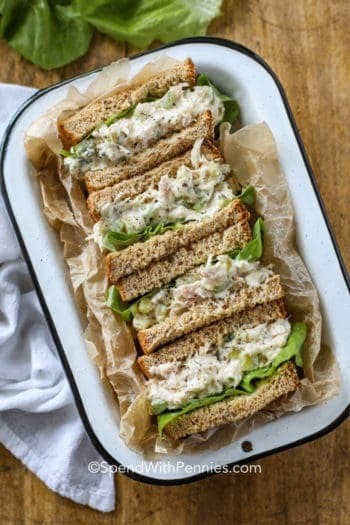 We love these best on white bread with the crusts removed but you can certainly make cucumber sandwiches on pumpernickel bread (or any kind of bread) if you’d like! 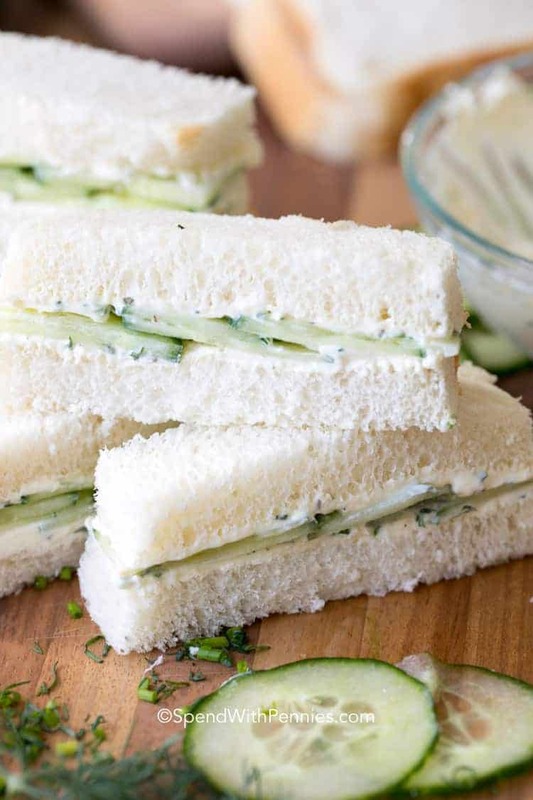 This cucumber sandwich recipe can be made up to 24 hours in advance. 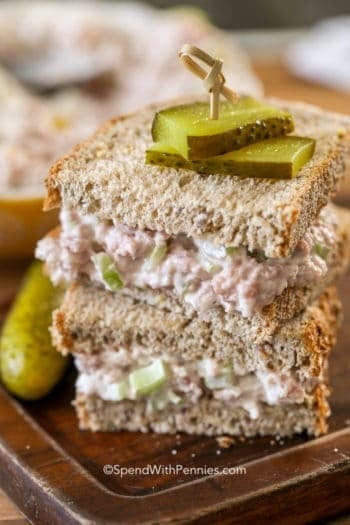 If you make sure the bread is covered with the dill cream cheese spread, they will not get soggy. 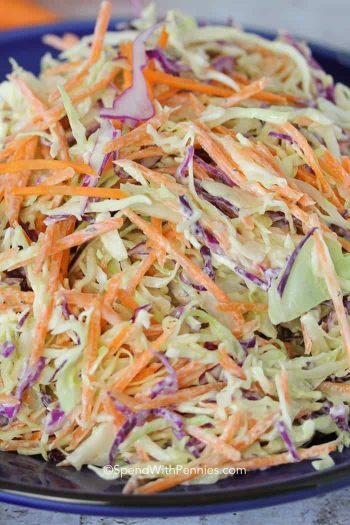 Once made and sliced, place in a container and seal well. Store in the refrigerator. I like to leave them at room temperature for about 20 minutes before serving. If you’re in a rush, using a flavored cream cheese (such a veggie cream cheese or herb and garlic) can make these extra quick! 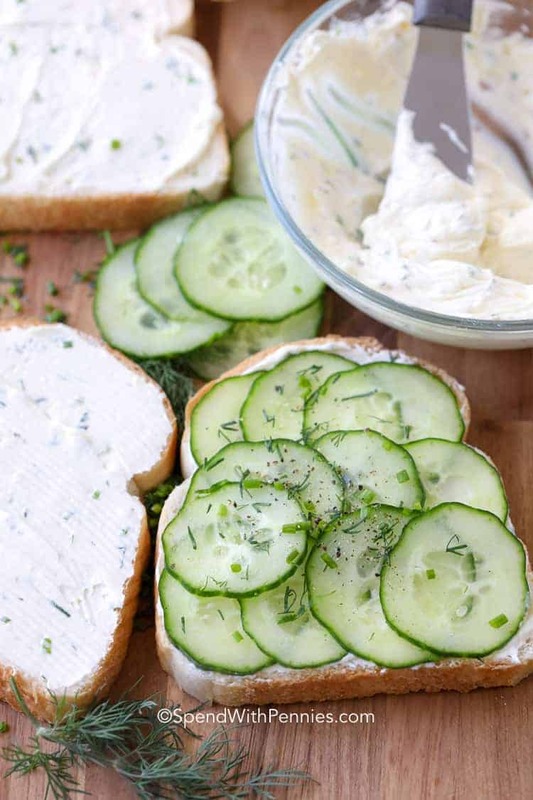 Refreshing cucumbers and an easy herbed cream cheese spread make the perfect refreshing sandwiches. 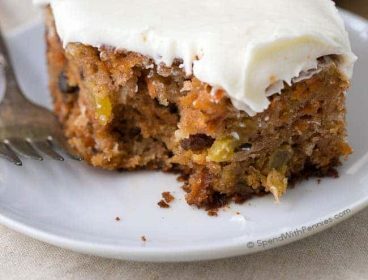 With a hand mixer mix cream cheese and mayonnaise in a small bowl until smooth. Stir in herbs, garlic powder and salt and pepper to taste. Spread bread slices with cream cheese mixture. 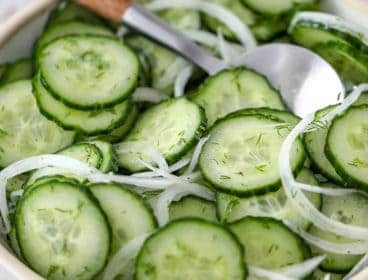 Thinly slice cucumbers. Layer over half of the bread slices. 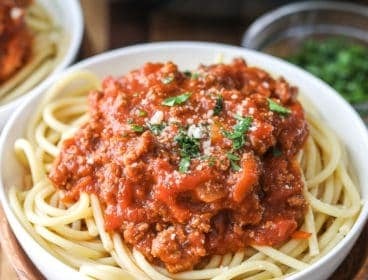 Top with additional herbs if desired. Top with remaining bread slice, remove crusts if desired and cut each sandwich into 3 pieces. 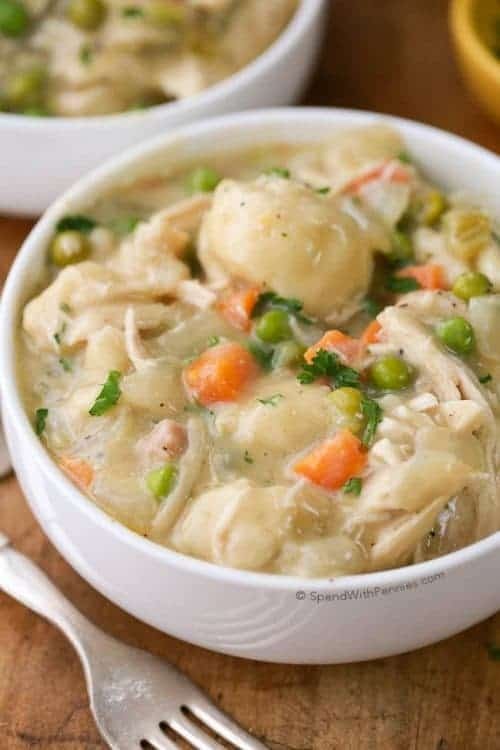 Serve immediately or cover and store up to 24 hours.